Dottie Rawsky and other members of Our Broomfield man an informational booth. In November, voters in several Front Range communities will consider whether to ban or delay fracking. Many of these same areas are also recovering from September's devastating flooding. There's renewed attention on the fight over fracking thanks to Colorado's flooding. Recent figures show that 12 spills have polluted the South Platte with 37,000 gallons of oil. 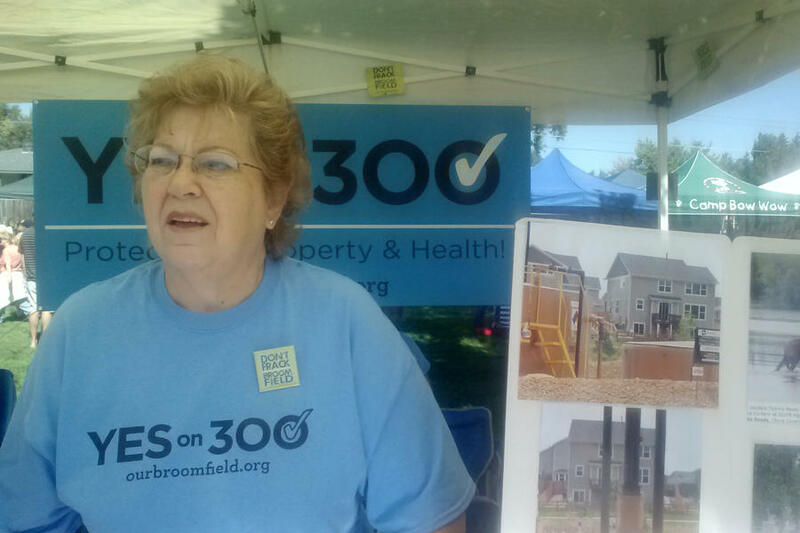 Both sides of the debate were out in full force during a recent community festival for the city of Broomfield. Voters there will decide whether to pass a five-year fracking moratorium. Broomfield resident Dottie Rawsky with the anti- fracking group Our Broomfield. "They keep getting closer and closer and closer to populations," said Dottie Rawsky with the anti-fracking group Our Broomfield. "So maybe one day they'll want to build down my street. I don't know. But right now I’m fighting for the people who are at risk." Public concern over hydraulic fracturing has ratcheted up in recent years as drilling moves into more and more communities. This fall residents of Boulder, Lafayette, and Fort Collins will also vote on anti-fracking ballot initiatives. Residents in the city of Longmont already voted to ban fracking. The city is currently embroiled in a lawsuit over the ban with both the oil and gas industry and the state. "It's reasonable to ask questions because it's an industrial process. I think it's fair to ask questions about it," said former Republican State Representative and current chair of the Broomfield Balanced Energy Coalition Don Beezley. While questions are understandable, Beezley thinks an outright ban or moratorium on the practice is the wrong approach. "We have to tap this resource responsibly. If you don't, it's like denying a man dying of thirst water," said Beezley. "The resource is going to be there. We know we can extract it safely. When we deny ourselves these energy resources, prices go up, jobs go down and people's lives are worse off." Supporters of fracking also say stringent environmental rules are already in place. "We try to look at this like any other industry and what we can do to protect it. So it's air quality, soil quality, water quality certainly," said Broomfield city council member, Republican Mike Shelton. The recent flooding along the Front Range has only highlighted the stark divide over the issue. At one point close to 2,000 oil and gas wells were 'shut in' due to the historic flood. Images of dirty water and toppled storage tanks quickly went viral in the aftermath. "So it's been unfortunately creating a lot of fear among our community members at a time when we really need to be coming together to do response and recovery efforts," said Tisha Schuller, executive director of the Colorado Oil and Gas Association. The industry group is tracking what they call "notable oil spills" along the South Platte River. 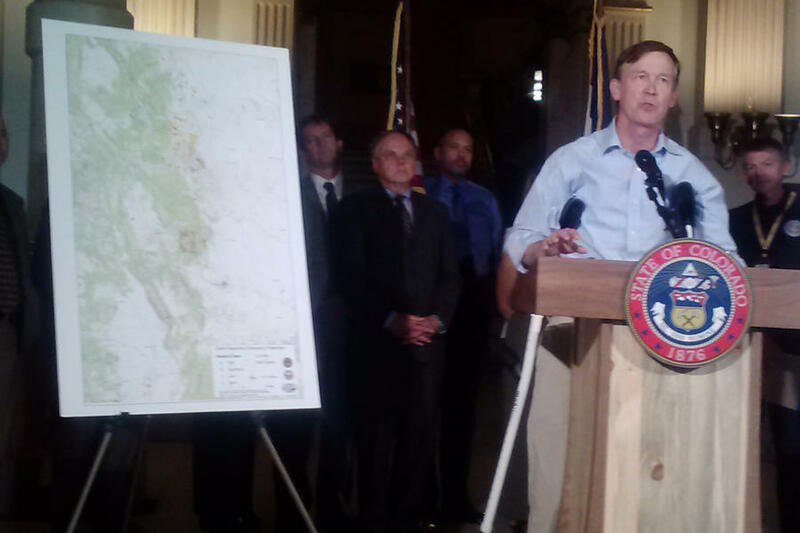 Governor Hickenlooper gives an update on flood damage. Governor John Hickenlooper says it could have been much worse. "When you look at the amount of water going through that river it will process these pollutants very, very rapidly," said Hickenlooper. "Not that any pollution is a good thing. But with a flood of this magnitude, to have as little as we've had." Activists and the environmental community aren't reassured by the Governor's comments. They worry the spills will create long lasting impacts. "We're talking about tens of thousands of toxic chemicals floating down the river, potentially ending up in communities, next to homes, next to agriculture land," said Sam Schabacker with Food & Water Watch. "We are just beginning to see the extent of the devastation." "It clearly demonstrates why these ballot initiatives are going forward to stop fracking." Weld County in northeastern Colorado, one of the most drilled in the nation, was also among the hardest hit by this week’s historical floodwaters. Gov. John Hickenlooper says he welcomes the increased production of natural gas in Colorado, but acknowledges sensible regulations are needed to protect human health and the environment. Most oil and gas activity is associated with open fields and rural Colorado. Residential neighborhoods along the Front Range though are becoming a site for development.